The entire three acres is protected by a 24 hour CCTV Security System. The cattery is upstairs alongside Denis’s apartment. All cat units have perspex divides allowing a cat to see its neighbour but without direct contact. The cattery is self-contained with its own kitchen, radio and television; indeed a comment made by a cat owner was likening it to the cat staying at home in the kitchen. Each kennel has its own sleeping area and covered outside run. The toy room has it own covered patio in additional to an outside exercise area. Outside there are a number of large exercise paddocks. When constructing the new building, mounds of excavated soil were left on purpose creating small hills. The major parts of the paddocks are allowed to grow freely with just the pathways winding through being cut. This makes exercise time an interesting experience for the dogs as it must seem that they are in a small jungle. The gundog breeds enjoy hunting and retrieving throughout the undergrowth, after a while the dogs will sit on top of the mounds surveying their perceived territory. 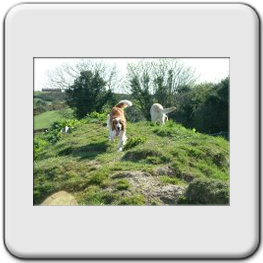 Click here to see the dogs enjoying themselves during supervised exercise time. 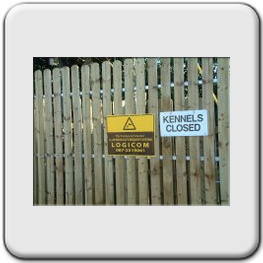 As shown in the construction of the kennels, all sizes of dog can be catered for, from small toy dogs to large breeds of dogs including Irish and Russian Wolfhounds. 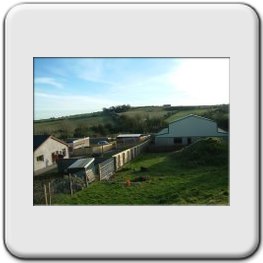 We can even cater for a large family of dogs with our special family units.